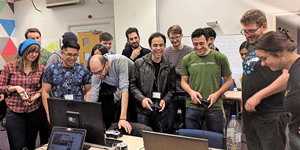 From 20-22 January, in partnership with the School of Computing and Digital Media at London Metropolitan University, we opened our doors and hosted a Global Game Jam event. Now the world’s largest game development and creation event, Global Game Jam happens across multiple physical locations and gives participants just 48 hours to develop, program and test their games. Dark Light – A game about navigating a maze in the darkness. Throw stones to create waves that will bounce on nearby walls and show you the walls of the maze. Mars Ranger – Control a Mars Rover on a research mission following communication loss from the Mars Colony. Using the Rover to place nodes on the surface of Mars, you have to scour the surface for remaining tech and clues to the fate of the colony. Release the Quacken – Out in the waves lurks the Quacken, a colossal rubber duck! You are the Quacken, and you must protect yourself from the swarms of boats and other hazards coming your way! Use your bounce attack to splash waves of water to push them away! Then use your Sonic Quack shockwave move to stop them! The finished games can now be downloaded online and are available for both PC and Mac.